Safari Jungle combo Buy It today! Safari Combo 4in1 Buy It today! Actual Size: 31 feet long, 17 feet wide, 18 feet high! Attendants: 2 required; can be you or us, must be us at a school or public location. Safari Jungle Combo Jump in the huge safari rainforest, hug a tree, leap over the giant mushroom obstacle, and Climb the mountain to Slide down the elephant's trunk! This four in one gives you more bounce for your buck! The Safari Jungle unit has the biggest size jumping area available in a combo unit, a climbing 'hill' with awesome, safe, (one child at a time) sliding down the elephant's trunk! 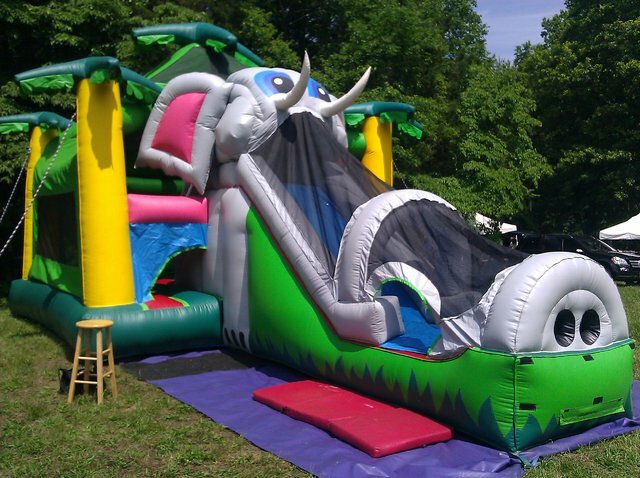 This Safari Jungle Elephant combo unit is: 31 feet long, 17 feet wide, 18 feet high! This awesome party pleaser will keep adventures playing for the entire day! We recommend two people to supervise this unit, one person to supervise the jumping area, the other the sliding area. Take the Jungle Safari to the Rainforest for an incredible impression and a unit that will challenge and delight your young explorers!